After hearing the story of Mingering Mike earlier this week, I've been thinking a lot about fictional bands. When Guided By Voices released their first rarities boxset, Suitcase: Failed Experiments and Trashed Aircraft, they created pseudonymous band names for different phases of the band's career. Here is the Antler version of "Buzzards and Dreadful Crows". As a bonus, I've included a demo collage from 1992's Propellor that starts with this "Buzzards". More on fictional bands to follow. Blogger/author/musician Ethan Hein has created some sample maps, graphically illustrating the paths of artists and the music they create or sample. 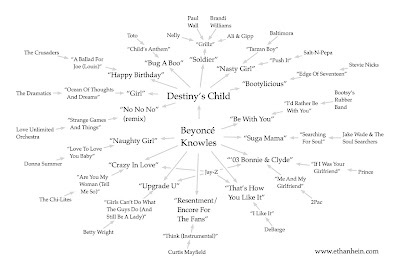 Here is one he made for the music of Beyonce, by which I learned of this Betty Wright sample on "Upgrade U". Many other sample maps can be found on Ethan's Flickr page here. Including a map of all the sample RZA uses on the GZA album "Liquid Swords"—I never would've heard the Frank Zappa in there without this. Monster summer jam samples > SNL appearances > blog hype? Jay-Z has history of using other rappers lyrics, especially Notorious B.I.G., in his own rhymes, leading to accusations of theft, Nas using it against him during their feud on the song Ether. Jay-Z defends himself on "What More Can I Say". He claims when he uses one of Biggie's lyrics he is only honoring his fellow Brooklynite, rapping "I'm not a biter/ I'm a writer/ For myself and others/ I say a B.I.G. verse I'm only biggin' up my brother". The line that follows is one of B.I.G. 's from the song "Rap Phenomenon". "What More Can I Say" also uses the same MFSB sample as "Keep Your Hands High", by Tracey Lee and Biggie. 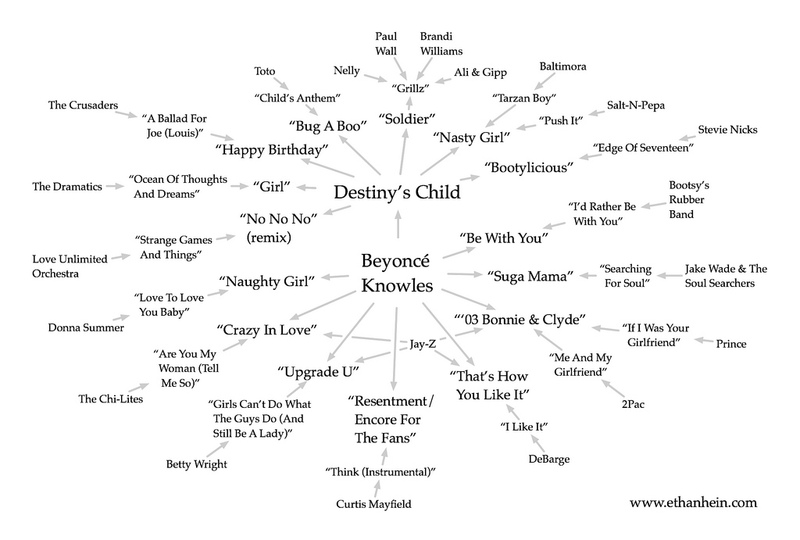 The B.I.G lyric Jay-Z borrows is "The rings and things you sing about, bring 'em out. It's hard to yell when the bar-rel's in your mouth." A few years later, that lifted lyric was sampled as the chorus for T.I. 's hit "Bring 'Em Out", no obvious reference made to Biggie's original line. R.I.P Guru. It's sad that he apparently made a deathbed renunciation of his Gang Starr partner, DJ Premier, as they have this inspired bit of sampling as a highlight of their legacy. Green Day's American Idiot opens on Broadway tonight. Here's the before and after of a musical makeover. The song is now best known for being "sampled" for Grandmaster Flash's "White Lines (Don't Do It)". The bassline was in fact replayed by Sugar Hill houseband bassist Doug Wimbish. On the new Erykah Badu album, "New Amerykah Part Two: Return of the Ankh", there is a song called "Turn Me Away (Get MuNNy)". She more-than-half-half covers the Sylvia Striplin song "You Can't Turn Me Away" (slightly different lyrics), but she also lifts the chorus call-out from one of the many songs that samples Striplin, in this case the Junior M.A.F.I.A./Biggie song, "Get Money". Get Money - Junior M.A.F.I.A. I've posted about Beck's Record Club before. Great stuff. They're working on INXS' Kick now. Here's the hit (or at least one of them). I particularly the glimpse we get into the band listening to the song at the start of the video. Record Club: INXS "New Sensation" from Beck Hansen on Vimeo. I had missed last year's Iron & Wine reissues album, Around the Well until this past weekend, when I came across his cover of New Order's "Love Vigilantes" on the Current. While this cover as well as the Flaming Lips and Postal Service covers—I'm sure that I first heard of I&W through "Such Great Heights"—are fine variations on the bare-acoustic treatment, he really gets it right on this Stereolab cover. SFTD reader Mark passed along this gem—the Roots covering the sample-based tracks of the late J Dilla—pointing out that Roots love to work with "acoustic instrumental imitations of synthesized or computer created sounds." He had first brought this to my attention when the Roots played as Jay-Z's band for his MTV Unplugged, replaying the sample-heavy production of Kanye West, Timbaland, etc. Here is the the acoustic-electronic-acoustic life cycle of a Timbaland sample. In a paper I'm presenting Friday at Rutgers—a comparison of "sampling" techniques in Latin patchwork poems called centos and mashups—I use Girl Talk's "Smash Your Head" as an example of the mashup aesthetic. I decided to put together a complete listen-on-demand source list for the song by cross-referencing the the wikipedia article and the Lala catalog. More paper-related info to follow.